Vancouver BC Storm Warning! Strong winds and heavy rains to the South Coast! You are here: Home » News » Vancouver BC Storm Warning! Strong winds and heavy rains! Vancouver BC Storm Warning! Strong winds and heavy rains! Inspecting your roofing, watching for any signs of concern before the inevitable series of winter storms roll through. After a weather event, if you don’t notice any obvious damage (i.e. 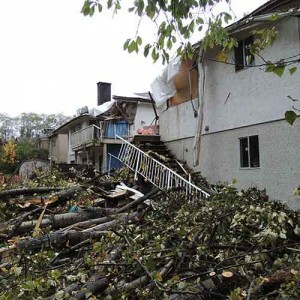 a fallen tree in your backyard, water dripping, or stains on your ceiling) it’s still a good idea to do a walk-around inspection of the exterior of your house to check for damage. From the ground, you can do a visual inspection of the roof, looking for any damaged or missing shingles. If there are trees around the perimeter, look for branches on the roof which may have caused punctures through the roofing or siding. If you notice pieces of your shingles on the ground, your roof is going to be susceptible to leakage. If you are not able to easily see areas of your roof, or you have any concerns, call an industry professional who can properly do a full inspection and provide you with an estimate if there is repair work required. Learn more about our Roof Repair Services, or contact us for a Free Quote: simply click to call 604-533-8322 from your mobile phone, or submit the Contact Form below.